In anticipation of The Total Customer Experience Leader's Summit, we're introducing a new guest blog series by Flavio Martins. Flavio is "The Customer Service Management Coach" and writes the blog The Mana.gr, for more about him, click here. If you attend only one event this year, make it a customer experience conference focused on designing an integrated customer experience with measurable impact. According to the recent Temkin Group Insight Report, the 2012 Temkin Experience Ratings, only 28 percent of companies earned a "good" or "excellent" customer experience rating. The Total Customer Experience Leaders Summit is the customer experience conference on a mission to change that. 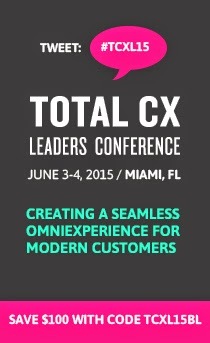 I'm excited to be blogging from the Total Customer Experience Leaders Summit this year. It's an awesome opportunity to be part of this amazing customer experience conference with so many industry experts and thought leaders. I hope you'll join me there! Let me take a minute and share some details to why you can't miss this year's extraordinary customer experience conference. What's this customer experience conference all about? For 2012, the Total Customer Experience Leaders Summit is a customer experience conference about breaking silos. It's about joining together diverse industry leaders to share genuine insights and best practices which speaks to the TOTAL customer experience process, a true customer experience conference. We challenge you to think of your customer throughout the entire process – how investment planning, onboarding, product development, sales, operations, customer service, employee training, marketing collateral and ROI fit together and align with your internal customer experience strategy. This customer experience conference will help you connect, develop, and enhance the customer experience process in your organization. Join us for a customer experience conference with 3-full days of innovative keynotes, and advanced case-studies that explore Customer Experience Design, Measurement & Feedback, Strategy, and Alignment. In the spirit of building a cumulative agenda grounded in insights, expertise and interactivity, we broke down our own silos and designed a customer experience conference with an integrated experience of all main stage presenters. We challenge each attendee at this customer experience conference to think of their customer throughout the entire process – customer experience design, measurement & feedback, strategy and alignment. In its second year at this customer experience conference, the idea gathering wrap ups are a staple to the Total Customer Experience Leaders Summit. These sessions allow for questions, feedback and open conversation that truly translates high-level talks to real-world insights and solutions. Learning is not industry specific, so why should our agenda be? At this unique customer experience conference, there are key insights to be learned from both sides, and at the end of the day customer experience is about the buyer, not the business itself. Are you the right fit for customer experience conference? As a small business leader, I don't have an unlimited budget, so I'm always looking to get the best bang for my buck. When researching products, services, and even events, I'm on the lookout for those that are the perfect fit because every decision counts. The Total Customer Experience Leaders Summit is that one customer experience conference you can't afford to miss this year. If you're involved in any of the following areas, you'll be sure to come away with insights and ideas that will carry you through the rest of the year. AND individuals who seek to enhance their own company's capabilities in these areas, ultimately driving business results through improved customer experience. I hope to see you at the Total Customer Experience Leaders Summit this year. I'm looking forward to this customer experience conference, and I hope you join me there where we'll connect with customer experience leaders from various industries and translate customer experience talk into excellent service action. Flavio Martins is The Customer Service Management Coach. As a blogger and customer service fanatic, bad service keeps him up at night so he's on a mission to show that excellent service can be consistent, simple, and easy.